Tellyo supported British Cycling to live stream the 2018 HSBC UK | National Cyclo-Cross Championships, held at Sunderland’s Hetton Lyons Country Park on Saturday 13 and Sunday 14 January. Utilising Tellyo’s live streaming capabilities, British Cycling multi-casted the event to social media and its own website, enabling online fans to experience the excitement of a cycling discipline that continues to grow across Britain. British Cycling also benefited from the Tellyo platform’s editing features, which enabled the organisation to quickly create and share short video clips of key moments and highlights via Twitter, as they happened over the two days. With over 81,000 people tuning in to live streams on Facebook and YouTube, British Cycling was able to take the National Cyclo-Cross Championships to an even greater audience during a packed weekend of racing – in which fans witnessed Grant Ferguson win the men’s elite title, while Helen Wyman was crowned women’s elite rider. 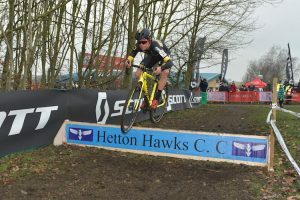 One of the weekend’s most popular Twitter video clips – created and shared via Tellyo – showed the eventual men’s under-23 winner, Tom Pidcock, bunny-hop the course hurdles on his way to victory: https://twitter.com/BritishCycling/status/952495288106782720. The clip achieved over 6,000+ Twitter views, amplifying this entertaining moment and rippling it out to more fans. Key stats from the National Cyclo-Cross Championships include: 81,486 watched the live stream via Facebook and YouTube, resulting in 2,858 engagements and a reach of 309,224; and 27 short video clips were created in Tellyo and shared via Twitter, which were viewed 76,201 times, creating 6,698 engagements and reaching 305,056 people in total.